If on your way to the museum’s lecture or recital halls you’ve ever strolled past the doors marked Distance Learning Studio and wondered what goes on behind them, the answer is “Lights, camera, action!” The space beyond these doors houses the Cleveland Museum of Art’s award-winning distance learning program, which offers arts-themed videoconferences for learners of all ages. 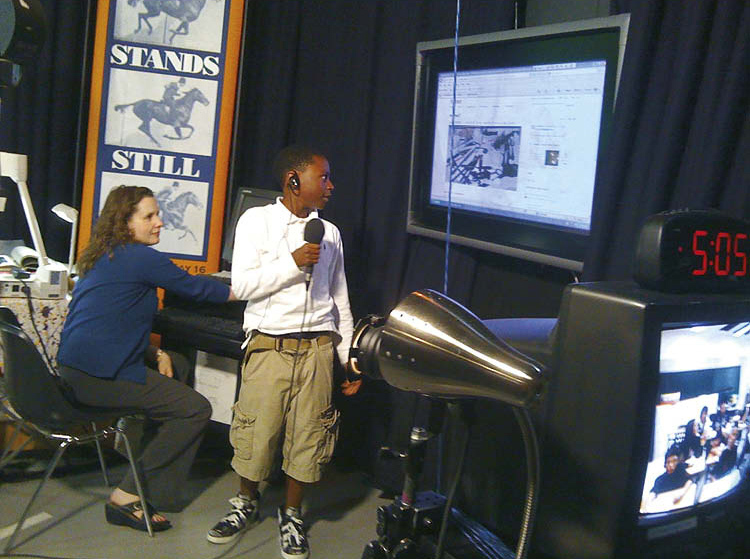 Established in 1999, the program has served students in 40 states and five countries through live presentations from the museum’s production studios. While nearly 200 museums offer videoconferences, the CMA’s program is a leader in the field, featuring more than 45 different topics to educate and entertain audiences from kindergartners to senior citizens. Videoconferencing is a teaching method that allows for pictures, sound, and movement to be transmitted simultaneously between two or more parties in different locations. Using a green screen, video clips, graphics, and interactive projects, the museum’s on-camera presenter leads the audience through a guided conversation with plenty of room for spontaneity. A technical producer brings up images from the museum’s collection while the presenter discusses these works of art or facilitates an activity. When a question arises, the presenter and producer can respond instantly by showing a related image on the screen. The program’s production equipment is stocked with more than 30,000 images ready to be summoned to support the flow of conversation. This flexible format supports a variety of topics, including Gods and Heroes from Greece and Rome, America’s Story, and Egyptomania: Mummies. For school clients, objects from the collection reinforce core subjects such as math, science, social studies, and language arts. In Angles and Answers: Origami and Math, for example, fourth graders discuss works by Mondrian to strengthen their understanding of polygons, angle sums, and perpendicular lines. A teacher writing from Westbury, New York, describes student reactions to the lesson: “We look at shapes and angles in a whole new way. Our kids love this videoconference and continue making origami for weeks after it’s over! The presenter [Arielle Levine] did such a wonderful job of pointing out math terms and reinforcing the students’ learning.” Audiences can also choose foreign-language presentations in French, German, Spanish, or Italian. Over the past five years, fruitful partnerships have mined videoconferencing’s collaborative possibilities. Among the museum’s most technically ambitious productions were a series of studio classes developed for students in rural Canada starting in fall 2009. The town of Grande Cache, Alberta, is so remote that there are no art teachers, art supply stores, or galleries within commuting distance. 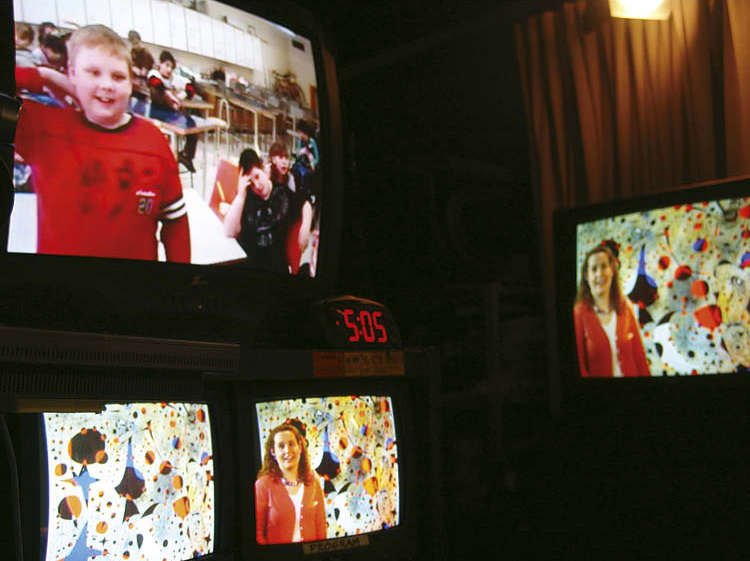 Seeking exposure to arts education for his school district, Grande Cache’s technology coordinator approached the CMA’s distance learning team with the notion of videoconferenced studio classes. In response, the museum delivered a 10-week photography course that provided opportunities for peer teaching, a visual exploration of the students’ own communities, and exposure to basic elements of design as related to photography. Toni Starinsky, an instructor from the Cleveland School of the Arts, led the sessions in the museum’s distance learning studios, using her photography students as teaching assistants. Students in both locations completed the assignments and then shared their results by posting photos on an image-hosting website. Discussion of their work followed during a subsequent videoconference. Each weekly session also included examples of master photographs from the Cleveland Museum of Art’s permanent collection. Students in Cleveland and Grande Cache experienced the cultural differences between their schools and neighborhoods and discovered common concerns through discussions and the photographs they created. Building on relationships developed through this project, the museum went on to teach a number of additional studio classes for Canadian partners. These multi-week courses included a six-part series on creating an illustrated book using storyboarding (a technique practiced in professional cartooning), and a 20-week studio arts course in which fifth graders explored collage, printmaking, and various media. Other international partners include educators in South Africa, Ireland, and Finland. Closer to home, audiences have emerged from the ranks of senior living facilities: Menorah Park, Laurel Lake, and the Jennings Center for Older Adults have all embraced video-conferencing. The Cleveland Clinic is another prized partner. Twice a month, the museum’s distance learning team connects with clinic audiences comprised of staff, community members, and the occasional patient. The simultaneous connections with the clinic include their Cleveland main campus facilities and the Lou Ruvo Center for Brain Health in Las Vegas. In recent months clinic audiences have participated in The Art of Adornment, Japanese Art: Humble and Bold, and Harlem Renaissance videoconferences, to name a few. Far and Near Through the distance learning studio, students around the world—and around Cleveland—make connections and learn through the museum collection. Looking ahead, the distance learning program continues to seek new delivery methods for its content. Special project assistant Joe Ionna recently worked with a number of partner schools to create additional subjects accessible via live webinar, a system requiring only a computer and an internet connection. Webinars operating in tandem with videoconferences promise expanded partnerships, offer a choice of access, and help share the museum’s collection with an ever-expanding range of participants. Reaching additional schools also means attracting financial donors. For the past several years a select group of museum patrons have thoughtfully replenished the distance learning program’s Low Wealth Schools Subsidy Fund. Because the program has been fee-based since the depletion of its original grant monies in 2004, many schools rely on subsidies in order to participate.